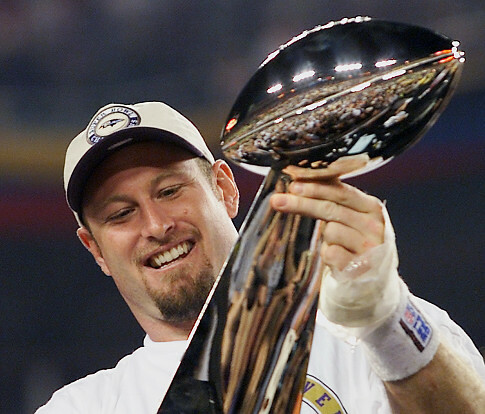 Baltimore’s Trent Dilfer may have been the least likely quarterback to win a Super Bowl. Yeah right, back in September you figured Joe Flacco and Colin Kaepernick were going to be the starting quarterbacks in the Super Bowl. You and all the other experts. The list of quarterbacks who have started a Super Bowl is a long and glorious one. Many of the game’s greatest QBs have flourished under the bright lights of football’s ultimate game. Bart Starr, MVP in the first two Super Bowls, kicks off the list. He joins a Hall of Fame Super Bowl QB lineup that includes such legends as Johnny Unitas, Roger Staubach. Bob Griese, Dan Marino, John Elway, Troy Aikman, and someday Brett Favre, Peyton Manning and Drew Brees. Joe Montana was a three-time Super Bowl MVP; Terry Bradshaw, Tom Brady and Eli Manning have all won two. And don’t forget Fran Tarkenton, who was the losing quarterback in three Super Bowls and Jim Kelly who topped that with four SB losses. Both are Hall of Famers. But that list also has some surprises, including this year’s matchup. At least four quarterbacks defied common logic to win Super Bowls. Others got to the Super Bowl, but lost. They are the unlikeliest starting QBs in Super Bowl history. Jeff Hostetler — A back-up for much of his career, Hostetler stepped into the breech when Phil Simms broke his foot near the end of the season — and piloted the Giants to a dramatic 20-19 win over Buffalo in SB25. Mark Rypien — The MVP of SB26, Rypien, right, passed for 292 yards and two touchdowns as the Redskins beat Buffalo 37-24. Two years later he was banished to the bench, then to Cleveland. (Hey, try winning with the Browns). Brad Johnson — A ninth round draft pick out of Florida State, Johnson did throw for 166 TDs in an otherwise mediocre career. Helped by three pick sixes by the Tampa Bay defense, he led the Bucs to their only SB victory in 2003. Vince Ferragamo — He threw 30 TD passes and led the Los Angeles Rams to SB14 in 1980, where they lost to Pittsburgh 31-19. Ferragamo had a decent game in what turned out to be the high point of his career. David Woodley — Woodstock as he was affectionately known in South Florida. was 4-for-14 for a mere 97 yards in Miami’s 27-17 loss to the Redskins in SB17. Two years later Dan Marino arrived. End of story. Stan Humphries — Perhaps the most unlikely starter in Super Bowl history, Humphries’ Chargers were victimized by the 49ers, 49-26, in SB29. Three years later he was out of the league. Chris Chandler — Chandler had a long NFL career, but never came close to equalling his 1998 season when he threw 25 TD passes and took the Falcons to their only Super Bowl. Rex Grossman — Only once in his career (in 2006 when he threw 23 as the Bears advanced to SB41) did Grossman throw more than 16 TD passes in a season. Oh yes, Chicago lost to the Colts. Craig Morton — In SB5 with the Cowboys, Morton, left, was 12-for-26 with three interceptions. In SB12 with Denver against his former team he was worse, 4-for-15 with four INTs. He finished his career with more picks (187) than TDs (183). Joe Kapp — A CFL refugee who played four years in the NFL, Kapp was the QB when the Vikings lost to the Chiefs, 23-7, in SB4. Although he threw just 40 career TD passes, he had a record-tying seven in one game in 1969. Jim McMahon — His Bears won SB20 over the Patriots, but the storyline was Chicago’s relentless defense. McMahon never threw more TDs than the 15 he tossed in 1985. Tony Eason — He started SB20 for the Patriots against the Bears, but after failing to connect on any of his five passes he was relieved by Steve Grogan. Jake Dolhomme — Delhomme passed for 323 yards and three TDs in SB38 as his Panthers lost to the Patriots. It was all uphill from there for Jake.